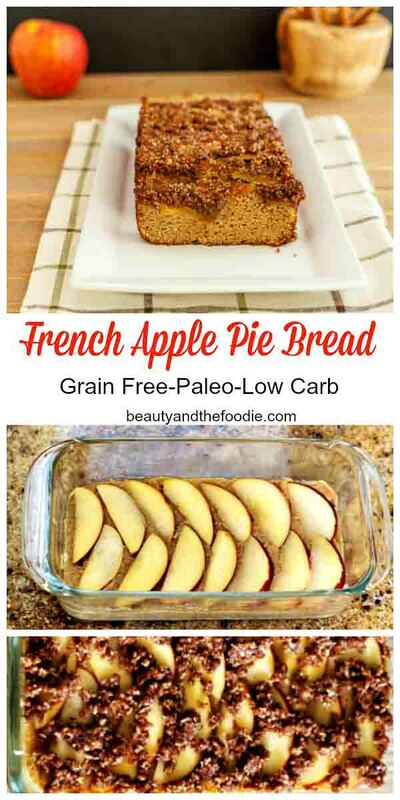 French Apple Pie Bread is grain free, gluten free and paleo with a low carb version. 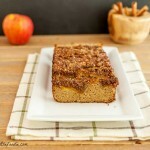 I am so delighted with this French Apple Pie Bread recipe! I love french apple pie with its sweet cinnamon crumbles and apples. But the amount of apples in a pie is just not low carb, and baking a pie from scratch is so much work. So I thought making a grain free bread loaf with just a thin layer of apple slices and a crumble topping. 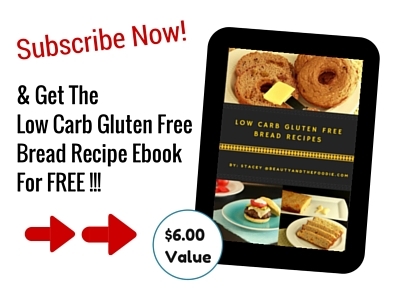 That way I get french apple pie flavor in an easy low carb and paleo bread recipe. I made this and ate a slice with breakfast every morning. When it was gone, I was sad, so I made another loaf. This one is a keeper! 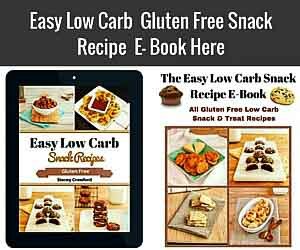 * For Recipe, Directions and Printable Recipe Card, scroll towards the bottom of the post. 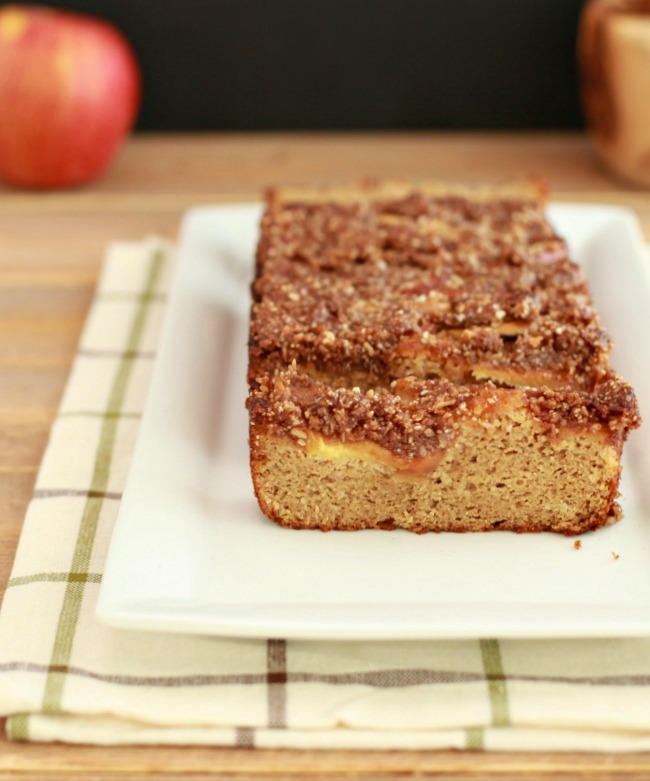 A sweet apple pie bread with a cinnamon crumble topping. Paleo with low carb version. ⅓ cup sweetener of choice: ⅓ cup coconut sugar for paleo or ⅓ cup erythritol granular for low carb (sugar free), I used Swerve brand. 2 tbsp sweetener of choice: coconut sugar for paleo or 2 tbsp erythritol for low carb, like this one. Preheat oven to 375 F, and grease or oil an 8 x 4 inch or 8 1/2 x 4 ½ inch loaf pan (medium size). In a large mixing bowl combine: coconut flour, almond flour, granular sweetener of choice, cinnamon, baking powder and baking soda. Mix together thoroughly. Set aside. In another large mixing bowl combine: eggs, unsweetened almond or coconut milk, unsweetened applesauce, butter, and vanilla extract. Mix together thoroughly. Add wet egg mixture to dry coconut flour mixture and stir together thoroughly. Add the mixture to the loaf pan and spread around evenly. 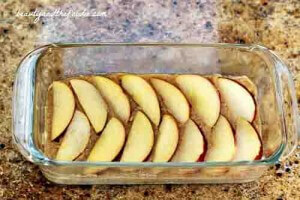 Take the apple slices and layer them across top of the batter in the loaf pan * see photo above. In a medium sized mixing bowl combine all the crumble topping ingredients and mix together until a pasty meal forms. 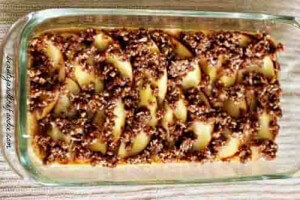 Spoon or sprinkle clumps of crumble topping mixture all over the top of the sliced apples in the loaf pan *see photo above. Bake at 375 F for 35 to 40 minutes or until toothpick comes out of center clean. Remove, cool and enjoy. I made this yesterday and it was sooo great!!! A+! Completely guilt-free and the measurements are spot-on. It’s definitely going in my book of faves 🙂 Thanks! Thank you so very much, Elina, for trying the recipe and your very kind words and for sharing your creative, but perfect substitutions. Hello! This recipe looks so very delicious and I’d love to make it for Thanksgiving with our family. Do you think I could dice the apples and put them inside the batter with just the crumble on the top? This apple loaf is amazing – made it last night and as someone else said, my whole house smelled wonderful. I omitted half of the applesauce and replaced with butter for a lower carb version and it turned out fantastic. The whole family loves it. Thank you! Thank you, Lisa, using the butter as a substitute is a great idea! Brilliant! Just made it tonight and whole house smells amazing – plus it’s delicious! 🙂 Thanks for sharing! Follow up: My non LC hubby LOVES this bread! 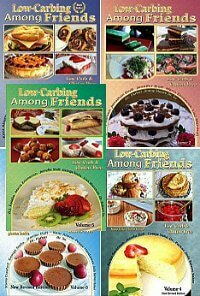 He and I are both diabetics but he refuses to go “full on low carb” (his words). Any time I can find a LC recipe that he really enjoys is a win! Thank you so much, Kitty. I’m so thrilled your hubby likes it! This looks so good & yummly!, can you use other fruit?. Wow, this bread looks marvelous! I am a huge bread fan, pinning this to my apple desserts recipes board, thank you for sharing! Just enjoyed a piece of this wonderful bread/cake. Thank you for the recipe. I had mine with some whipped cream. I added some walnuts to the bread. It was a real treat!!! Wow I love this! Just made a loaf. I’m in the UK so I’ve had a few slices for breakfast. I can’t work out whether it’s more cake or bread. Do you think it would toast? Julie, thank you for trying the recipe and your kind words! I think it is a bread / cake hybrid 🙂 I have not tried toasting it, but it might work out in a toaster oven. Awe thanks Suse, I am thrilled that you are enjoying it. Thank you so much for sharing the recipe 🙂 I think it is the apple sauce that makes it moist. Thanks for the great recipe! I made this bread today and my whole family loved it! 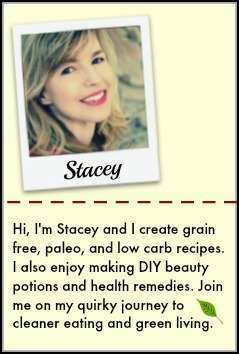 I’ve been on the Wheat Belly Diet for three months and am always searching for good recipes, as I love to bake! This is one of the best bread/cake recipes I’ve found to date. Rain, I’m so happy and pleased to hear that. I love baking too, and it has been a challenge making everything Gluten free. Just made this for the first time tonight and made two loaves. I couldn’t wait for them to so cut a slice off one while still warm. I think I dies and went to heaven! This is soo good. This is the first low carb thing I have baked and am so glad I did and that I went ahead and doubles it. Thank you so much for this recipe. I love french apple pie too! I haven’t been able to eat it in so long though, since I found out I was severely gluten intolerant. 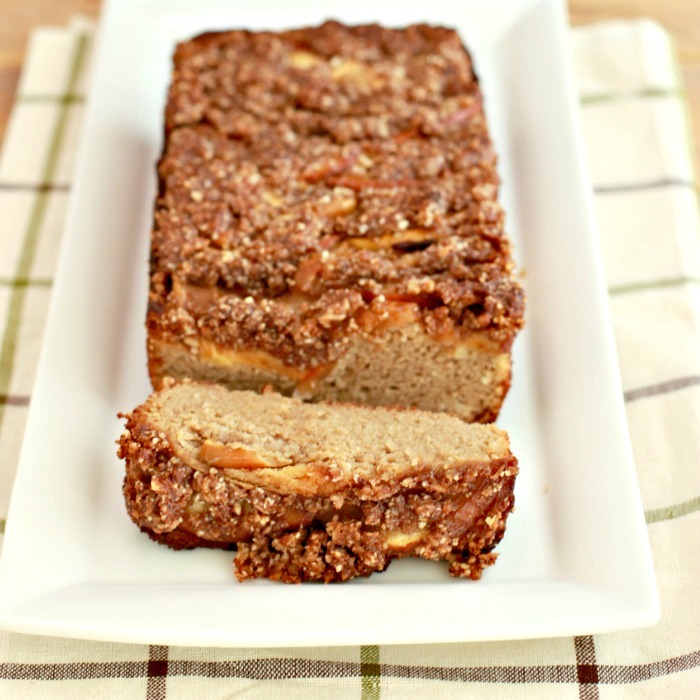 This reminds me of the german apple streusel bread I used to eat almost every morning as a kid. Great recipe!! Awe thanks Dana, your very kind! I almost named it Streusel bread. what do you serve with the bread? MM, It is a treat bread (sort of like banana bread is). I don’t think you need to serve anything with it, as I eat this with a fork like coffee cake. This bread sounds amazing. I’ll try it. Thank you Stacy. This looks Delicious, definitely will be trying this after I get more almond flour! Thank you Tracey. I think you will love it!